With our simple eight step process, you’ll be well on your way refacing your cabinetry and saving a bundle at the same time. 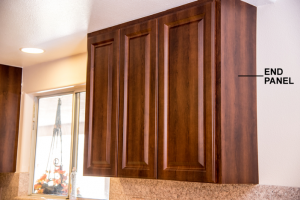 Refacing your cabinets is an excellent choice when giving a new and updated look to your kitchen, bathroom or any area where there are cabinets and drawers. Our Rigid Thermofoil (RTF) doors, drawers, trim and moldings come in beautiful wood grain and contemporary patterns and colors. We guarantee that we will have the right look for you! From traditional to contemporary, our choices include dozens of options for panels. Our line of accessories including trim, moldings and hardware (knobs and handles) provide the perfect finish to your refacing project. Our Cabinet Refacing Guide below takes you through a step-by-step approaching from start to finish. If we can be of any assistance and answer any questions about the refacing installation process, please contact us at (800) 350-6403. Step 1a: Do you have Framed or Frameless Doors? This is one of the most critical parts to ensuring that you order, and that we make, the correct doors and drawer fronts for your cabinets. 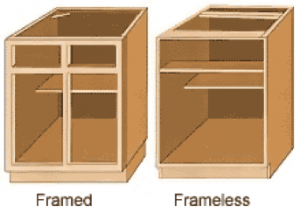 There are two basic types of cabinets: Framed and Frameless. 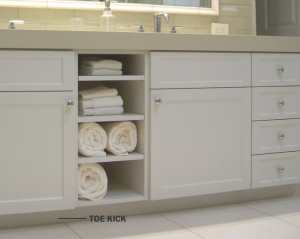 For Framed cabinets, the standard “overlay” (size of the frame that is covered by the door or drawer front) is 1/2″. This means that the door size is 1″ wider than the opening width (1/2″ on each side), an is 1″ taller than the opening height. 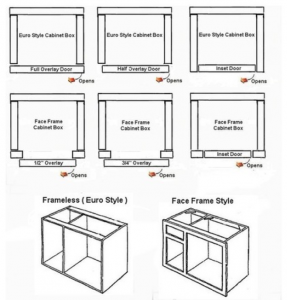 However, framed cabinets can have various overlays – from 1/4″ to 1-1/4″. When determining the overlay that you will use, be sure to add the measurement to both sides of the width measurement. For example: A 20″ opening with a 1/2″ overlay will be 20″ + 1/2″ (overlay on the left) + 1/2″ (overlay on the right) = 21″ total measurement for door width. Calculate the same way for the height of the door. Frameless cabinets can be measured by using the overlay method or by measuring the existing doors. To ensure that you’ve measured all of the doors and remember which sizes go where, it’s always a great idea to draw out your cabinets as you note your measurements. It doesn’t have to be fancy – just a visual representation of your layout works. We do recommend using a ruler for straight lines, although you do not have to draw to scale. Simply indicate the measurements and you should be just fine. NOTE: You will order Thermofoil sheets for ends, bottoms, toe kicks and faces. 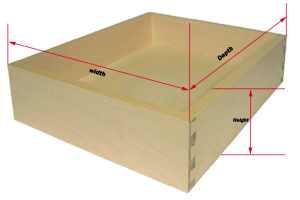 If you will be needing new drawer boxes, the diagram below shows how to get the proper measurements to ensure that the new drawer boxes will be a fit. After measuring for the drawer boxes, you will also need to provide the Drawer Front measurements. If you have not already taken the Drawer Front measurements, refer to Steps 1a and 1b to get these measurements. One of the last items to measure are the sides, faces and even back walls of your island or peninsulas. Our Thermofoil comes in 24′ x 96′ sheets to accommodate your cabinets. We advise you to allow for X amount of overage when making these measurements in order to ensure that you receive enough material. Don’t forget to also measure your toe kicks. 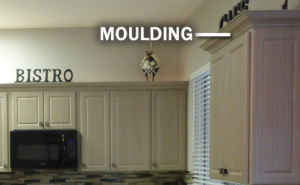 For moldings and corbels, they will also have a matching finish. 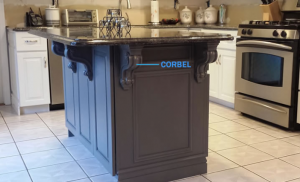 See the examples below of End Panels, Moldings, Toe Kicks and Corbels. Check for frame condition and new hinge location and look for defects and damage such as warpage, joint separation or water damage. Take a look at the shelves and make sure they are not warped. Lastly, examine the frame and make sure that it is solid. Option 1: Place your order for cabinet doors, drawer fronts and moldings from our website online. We have 50+ stock thermofoil colors and over 30 styles and routes available online. Option 2: Fill out our Online Form and submit for a free quote. Option 3: Download our Order Form (PDF) and email or fax in for a free quote. Option 4: Call us directly at (800) 350-6403 to speak with a specialist. We have an extensive catalog of hundreds of colors and patterns as well as many more route styles when contacting us directly. For your convenience, our most popular door styles and colors are available online. However, our specialists are ready to assist you at any time on your order. When you receive your order, please be sure to carefully unpack each box that is received and refrain from using any sharp objects such as knives or blades to cut any packaging. This will ensure there is no damage when packing your order. Once you have unpacked your order, ensure that every piece order arrived. If you are missing any parts or received a damaged item, please contact us directly. To being the install, ensure that your kitchen, bathroom or whichever room you’re installing in is best protected from debris and dust, cover your floor, walls, counter tops and appliances. During refacing, there will be dust and vapors from glue. Please ensure that your work area has plenty of ventilation.